Pantograph and Contact Line System comprehensively introduces pantographs, contact lines and their interactions in many areas including geometrics, dynamics, materials, and electrics—helpful to understanding the basic theories of interaction between pantographs and contact lines. 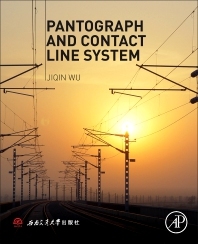 The book examines application techniques for system design, construction and maintenance, and includes suggestions to keep pantograph and contact lines working in a safe and stable manner over the long term. In railway traction power supply system, the match between pantograph and contact lines is critical for reliable power transfer. The book provides application techniques for system management and parameter selection in design, construction and maintenance. Professor Wu graduated from Southwest Jiaotong University in 1988 and received his BSc degree. He has nearly 20 years’ of experience in teaching and researching on basic theory of pantograph and contact line system, and has participated in the projects of design, construction and maintenance of Chinese overhead contact line system. He directed high-speed overhead contact line system vibration tests for high-speed railways such as Beijing-Tianjin, Wuhan-Guangzhou, Zhengzhou-Xi’an, Beijing-Shanghai, and construction of contact test bed of pantograph and contact line system in National Laboratory in Rail Transportation. He has published 3 books and more than 40 papers in pantograph and contact line system.